Spondylolisthesis is most often caused by a stress fracture ( Spondylolysis ). 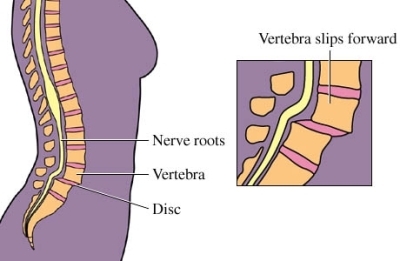 The fracture can make the vertebra unstable and allow it to slip forward. This type of fracture often occurs when a lot of stress and pressure is put on the back. This can occur with certain sports activities. The condition can also be caused by spinal problems that are present at birth, like spina bifida . Physical therapy usually involves exercise. The exercise will focus on strengthening the abdominal and back muscles. A back brace may also be recommended. If you are overweight, your doctor may recommend you lose weight. This will help reduce stress on the spine. Pain medications, such as nonsteroidal anti-inflammatory drugs (NSAIDs), may help manage pain. Surgery may be needed if the bone has severely slipped or you do not respond to treatment. Surgery will fuse 2 of the vertebra together. The procedure is called spinal fusion . Get plenty of rest between workouts. Take measures to protect your back when participating in sports. Spondylolysis and spondylolisthesis.Ortho Info—American Academy of Orthopaedic Surgeons website. Available at: http://orthoinfo.aaos.org/topic.cfm?topic=A00053. Updated September 2016. Accessed November 27, 2017. Spondylolisthesis. EBSCO DynaMed Plus website. Available at: http://www.dynamed.com/topics/dmp~AN~T116263/Spondylolisthesis . Updated July 13, 2017. Accessed November 27, 2017.